Getting edit distance from sam tags MD & NM: conceptual misunderstanding? Question: Getting edit distance from sam tags MD & NM: conceptual misunderstanding? I'm having a hard time implementing a calculation of the edit distance from a sam record. 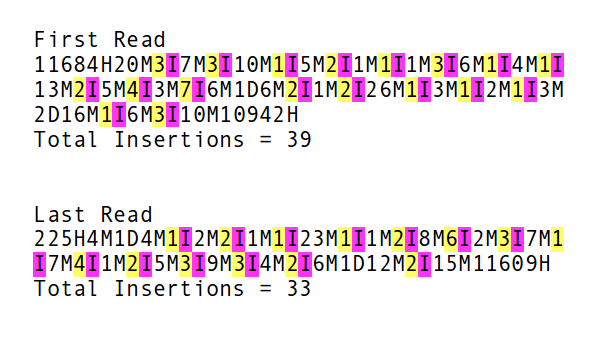 For a bwa mem alignment, I would resort to taking the NM tag (explicitly defined as the edit distance), but this tag is not set by all aligners, so that's where the trouble starts... Alternatively, I would parse the MD tag to get the number of matches and subtract that from the aligned length. But conceptually that doesn't seem equivalent to the MD tag. I scale both to the aligned read length. I should clarify this is for analysis of Oxford Nanopore data, which is dominated by indel errors. I'll add my python code for calculating both "definitions" of the edit distances. I use pysam, but it's more about the logic than the actual code. divide it by the length of the alignment. This excludes clipped sequences from the calculation. I divide this by the length of the alignment. This excludes clipped sequences from the calculation. To me, both calculations sound logical, but as a sanity check, I decided to plot them against each other for a sample dataset aligned with bwa mem to see how these metrics correlate. And this result seems okay (correlated) for many reads but deviates quite a lot for a subset. I think my mistake is conceptual or a misunderstanding of those tags. I assume something about how indels are taken into account is tripping me up. I think ideally I would take query and reference sequence and calculate the Levenshtein distance, but I'm afraid that's not very efficient for processing thousands of reads. Do you have better solutions? NM:i:<n> The edit distance; that is, the minimal number of one-nucleotide edits (substitutions, insertions and deletions) needed to transform the read string into the reference string. Only present if SAM record is for an aligned read. Note that edit distances are one-nucleotide edits. But this will give only the INDEL's edit distance. There are 3 SNPs, (C, A, G) missing from this calculation. This is also evident from the plots that your MD is lesser than NM. In fact, the NM for this is 6, as reported by BWA. Hi Santosh Anand, Thanks a lot for your reply. That seems right, but I'm not sure where you got the 100 from. I assume that's the aligned fragment length. As is evident from the plots below this new calculation is definitely an improvement. The dots deviate less from the bisection, and the Pearson correlation coefficient is now 0.96. But it's not identical to the NM tag calculation, yet. I wonder if insertions are properly accounted for. Will do and get back to you soon! A few examples with in the first column the NM tag, then the computed edit distance from the MD tag, followed by the MD tag and the CIGAR string. Anything else that you would like me to add? Actually, you are still missing the Insertions, which can be counted from CIGAR string only. The MD will not give the Insertions. See the image below, and if you add INSERTIONS as calculated, the numbers match. I still have no idea what is happening in 2nd Read though, looks very weird MD & CIGAR. Looks like I'll need to parse the CIGAR string as well then. Thanks for your insight! Will come back with the results of that. How's that for a correlation?! I might write a short blog post about this journey with some code and obviously have to refer to you for fixing this. Do I use your biostars username? And here we go, Friday afternoon blogging: Getting the edit distance from a bam alignment: a journey. Wondering, why this bimodal density distribution? Yes, I've wondered the same. The average base quality scores show the same bimodal distribution, so presumably, some pores generate lower quality data. Can you also add read length (both the clipped and original) ? BTW, why are you normalizing wrt read length? Because your reads are trimmed or what ..? Since this Nanopore data the read length varies widely, from ~1kb to ~60kb. I don't want longer reads to get penalized more, obviously. How To Define Percent-Identity From A Cigar String/ A Bam/Sam File?